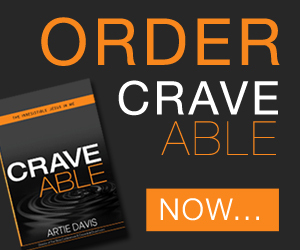 Artie Davis has done the impossible: he has made me not only want to read a devotional book, but he's written a devotional book I actually...enjoy. Far too often, Christian authors will write a devotional book that falls into one of two camps: the dry, theologically heavy-handed "just pray this and everything will be okay" daily kind, or the pithy, thematic, surface-level theology, feel-good kind. The former makes for what many people perceive our faith to look and act like while the latter is what sells at kiosks in airports or endcaps in bookstores and makes for the "perfect" Mothers Day gift. To find a devotional book that balances being bold without being judgmental, that speaks the truth in love, that engages the reader and challenges them beyond a brief "takeaway" for the day, and that reads more like a conversation with the author than a seminar given by a marketer is nearly impossible. Craveable reads more like a love letter from someone who wants to help fellow believers grow and be challenged in their faith than anything else. I've had the pleasure of hearing Artie speak before, and I can hear the genuine passion he brings to the stage in the words printed in this book. This is a man - a pastor, a husband, a father - who is drawing from his years of experiences, both good and bad, in order to guide others into a deeper love and passion with their God. And "guide" is the keep phrase here: rather than telling the reader what to do, Artie invites the reader into the journey. There is no "for Problem X try Solution Y" formula present in the book. The author understands that true spiritual growth comes through personal experience, not mimicry. The only aspect of the book that I didn't like was when Artie suggested the reader stop and take the book as a 40 day journey, reading a chapter a day, which annoyed me because I wanted to just keep reading it. I understand now that had I just plowed through it, as was my natural inclination, I would have missed out on so much of both what he was saying and what I was to gain from the book. Because the book is so honest and truthful, in both requiring self-reflection and in the stories Artie shares, it's the type of Christian devotional book which might scare many readers. ...which is a shame, because this is the exact type of book so many believers need to read. Neither the book nor the author come across as preachy or self-important. The tone of the book is personal, and isn't "catchy" or doomed to be outdated by the time you finish reading this review. It's a style of book that many of us have been hungry for. So, you know, the title just makes it that much more witty. Disclosure of Material Connection: I received an advance copy of this book free from the author and/or publisher. I was not required to write a positive review. The opinions I have expressed are my own. I am disclosing this in accordance with the Federal Trade Commission’s 16 CFR,Parti 255.